With our BrakeChecker Rewards program you get $10 off your first oil change and every fourth oil change is free, even on synthetic and diesel. 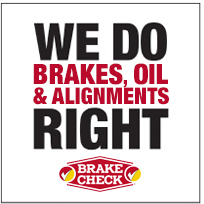 Additionally, with our free 2-minute alignment check, our oil change saves the life of both your engine and your tires. With our lifetime alignment guarantee we’ll check it and, if needed, align it for a $2.70 documentation fee with every oil change. No oil change coupons needed. Just walk in and start saving today! Walk In For Your Oil Change and Start Saving Now! You can go to any corner quick lube and get an oil change, but why would you choose us? At Brake Check, we do oil changes right, and when you buy our lifetime alignment warranty you also get a free alignment quick check and, if needed, a readjustment for only $2.70 every time you get your oil changed for as long as you own your car, preserving the life of your engine and your tires! 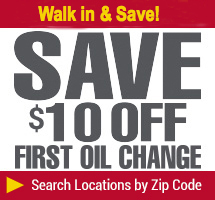 Find the oil changes near you and start to save today! Every oil change includes a FREE 2-minute alignment quick check to help you protect your vehicle and prolong the life of your tires. And when you add our Lifetime Warranty Service, we’ll check AND align your vehicle for FREE at every oil change. Now that’s a BETTER OIL CHANGE! w/ Free Oil Change $22.41 ea. w/ Free Oil Change $24.66 ea. w/ Free Oil Change $37.30 ea. w/ Free Oil Change $54.51 ea.